A Mackinaw City, MI campground owner is asking for public support for the proposal to add a computerized LED lighting system to the Mackinac Bridge. The LED lighting of the bridge will boost tourism, save energy and allow the Bridge to change how it appears, reflecting seasons, holiday colors and commemorative events as well as just beautiful displays of changing lights. 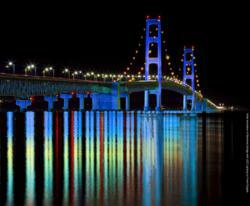 A LED lighting system is a way to make the 50 year old Mackinac Bridge "New" again! A Mackinaw City, MI campground owner has a dream. Vince Rogala, of Mackinaw Mill Creek Camping, would like to see the Mackinac Bridge outfitted with a computerized LED lighting system. "The system would create a five mile long, 552 foot tall light display, not to mention save energy and lower maintenance costs," said Rogala. "There could be a different color theme each month or even each night. Imagine holiday colors (Green for St. Patrick’s Day, Red for Valentine’s Day), as well as commemorative displays (blue for Autism Awareness and pink for Breast Cancer Awareness). It’s a way of making the 50 year old Mackinac Bridge 'new' again! It is possible to make the Mackinac Bridge an even greater attraction," explained Rogala. Rogala received an invitation to present his idea to the seven-member Mackinac Bridge Authority at their July 2012 meeting on Mackinac Island. The Mackinac Bridge Authority, which was established in 1950, oversees the financial and legal services necessary to preserve and maintain one of the world’s leading suspension bridges. “It was a great opportunity to get in front of not only the decision makers on the panel, but also the engineering staff for the bridge,” said Rogala. Vince’s presentation showing artworks, narration, and a short video was set to run about 8 minutes, but ran well over 20 minutes as board members asked questions and expressed their thoughts. 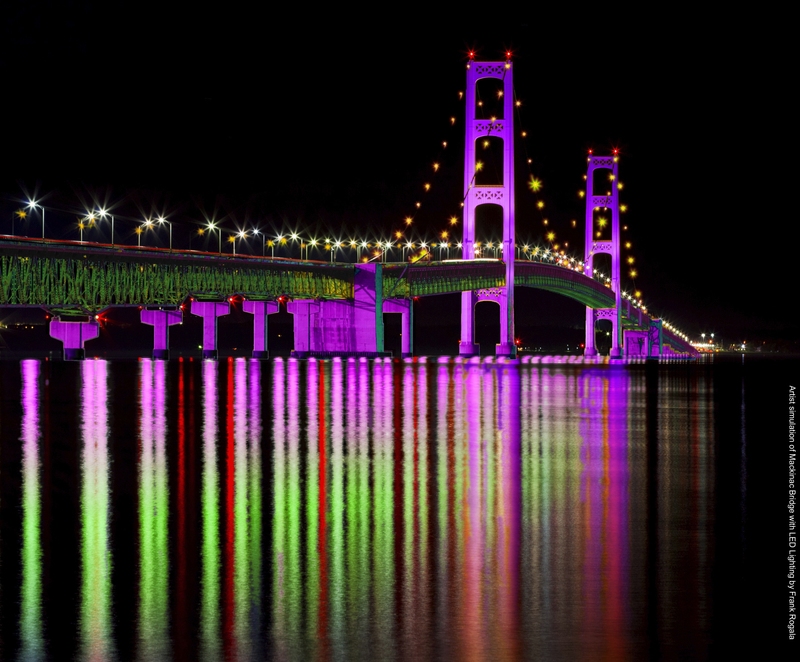 “To sum it up I'd say the Mackinac Bridge Authority is intrigued with the concept of an LED lighting system for the bridge. They were very open to the idea. We discussed thoughts on how to balance and preserve the historical character of the bridge with a fresh modern element. After finishing, the board took the time to compliment my presentation” said, Rogala. Explaining further, "The Bridge Authority encouraged me to continue building local and state wide support, to pursue ways to finance the project, and left an open invitation to readdress the Bridge Authority as the undertaking moves forward” said Rogala. The origin of the idea came to Vince as he was researching LED lighting for illuminating trees. Vince is one of four brothers who operate one of Michigan's largest family owned campgrounds, Mackinaw Mill Creek Camping, (http://www.CampMackinaw.com). “I was looking on the web for a new way to provide nighttime lighting that was both practical and tranquil for our campground. I came across LED architectural lightning on large structures, one of which was a bridge, when instantly it dawned on me - how amazing the Mackinac Bridge would look with LED lights!” explained Rogala. "I wasn’t sure how popular or possible the idea would be until I started casually telling people about the concept. Everyone was eager for more information, and full of lots of questions. I knew I needed help spreading the word, so I asked my brother Frank to give me a hand," explained Rogala. Vince and Frank both have experience in the entertainment industry, having signed a record deal together in Hollywood just after graduating from Mackinaw City High School. Experienced at creating music, video, and films, they have landed their work on major record labels, MTV, the Sundance Channel and NetFlix. “Frank has the artistic skills in video, sound, and the Internet that were needed to bring this idea to a bigger audience,” explained Vince. As an enthusiastic champion of the Mackinac Bridge, Rogala has seen the bridge from many viewpoints, “Like hundreds of thousands of others, I have walked the five mile span on the Labor Day Bridge Walk. I've taken sunset cruises under the bridge, walked through the underbelly of the steel superstructure with the rumble of traffic just above my head”, but Rogala recalls his most exciting memory was while working as a videographer. Shooting the Bridge provided Rogala the rare opportunity to go to the very top of the 552 foot towers on three different occasions to capture footage. “It was both terrifying and breathtaking,” recalls Rogala. Vince adds, "Coincidentally, Frank had just finished creating an artist rendition of what the bridge could look like lit with LED lights for the 4th of July, on the actual 4th of July. That very night at our campground, which has a mile of shoreline on the Straits of Mackinac, a couple thousand of our campers gather along the shore to watch the 4th of July fireworks from Mackinaw City, St. Ignace and Mackinac Island. Those fireworks always raise cheers and I thought 'what if the 5 mile long bridge was simultaneously animated in Red, White and Blue during the fireworks' - it would be spectacular. There would be nothing like it anywhere else." Following the suggestions of the Mackinac Bridge Authority, Rogala is asking the public to show their support by liking the "Light The Mackinac Bridge" page on Facebook (Facebook.com/LightTheMackinacBridge) and by spreading the word by sharing the video about the project or leaving a comment at http://www.LightTheMackinacBridge.com and following the effort on Twitter @LightTheBridge. 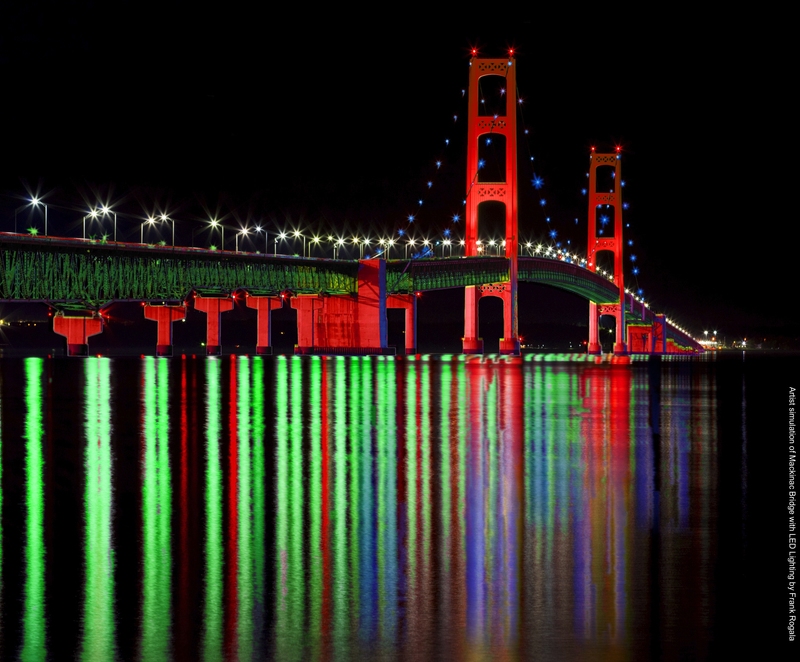 Rogala is beginning work on a fundraising effort to raise money for billboards, media and internet ads in order to gain public and political support as well as corporate sponsorship to "Light The Mackinac Bridge" .